A lot of pet owners decide to install dog doors to give their pets the freedom to go in and out of their homes without human intervention. This is a great innovation that allows dogs to go outside and relieve themselves whenever they want or come back in when the weather outside is too hot or too cold. Dog doors are available in a lot of different sizes. Pet owners should consider the size of their pets and estimate how much more they can grow while they reach adulthood before settling for a particular doggie door. 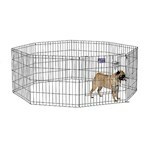 Also known as dog gates these products primarily have plastic flap construction that's both safe and sturdy. Pet owners should also look at products that have a locking mechanism as it prevents unwelcome animals from entering their homes. Some manufacturers also sell electromagnetic pet doors that sense your dog when it's near and unlocks automatically. This is a great way to keep your door always secure without restricting the movement of your pet. As far as dog doors are concerned, we at PetCareRx are dedicated to bring you the best. Featuring various brands including Dog Mate, we bring you some of the best dog door products available in the market today.